Dear Mario, now we live in different spheres, but I feel that our spiritual and moral contact, our friendship and sympathy have not disappeared and cannot ever disappear. Only after the death of a man can we appreciate the real meaning of his life because in everyday life is almost impossible to appreciate the magnitude of the work of others. 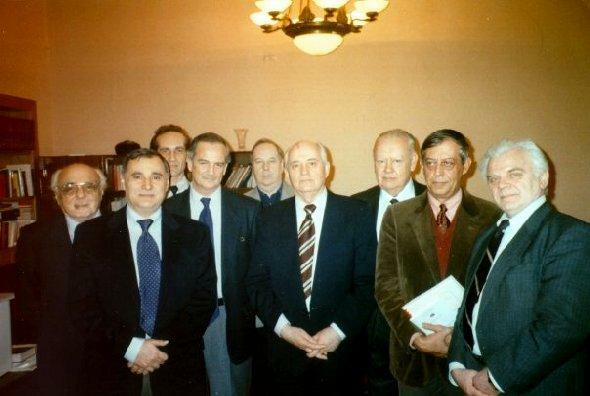 Moscow 1993. Front row from the right, Boris Koval, Silo, Gorbachev. Allow me to express my feelings of sadness now that Mario is in another sphere of existence. Thanks to you and the whole family, he had good conditions to think, work, participate in the Movement, write, and many other things. That is why for us you are an integral part of Silo, a friend, a wife, an organizer of family life. I visited Mendoza only once and I recall this visit as if it were today. In that moment I understood very well what an important role you played in the life of Silo, and I feel that he is here with us, and that his intellect, his joy, his charisma and character, his image, exists in our hearts and that's why I, like many others, are happy to have worked with him. I understand your sadness very well because three years ago my wife Vita also departed, but life continues and I am sure that you have great internal force to be able to overcome this sadness. I have written a letter to Mario and I'd like to include it with this message to you. All my love and sympathy to you, Alejandro, Federico, and to all of Mario's friends in Mendoza. Antonio has told me that you have left this world and we now live in different spheres, but I feel that our spiritual and moral contact, our friendship and understanding has not, and cannot ever disappear. You and we, your friends, continue to carry out your project in different forms. You in other spaces, we on the Earth, working to humanize life and free the human being from all evil and suffering. I think that it’s only after someone’s death that one can appreciate the real meaning of that life. In the days and hours of daily life it is almost impossible to see the magnitude of other’s work. Now when I think about you, your life and work, I better and more deeply understand what an exceptional figure you are, not just for me but for many. I would like to express all this to you because of the love I have for you and because I am filled with a deep sense of gratitude for the joy of having had contact with you. Before – because you are such a modest person who never sought recognition – it was impossible for me to express my love and gratitude. My words are not an analysis but a sincere testimony about the importance and meaning of your life for me. Dear Mario, let me say something about your character as a human being. You are a person who is very normal, very modest, very vital, amiable, sincere and alive. Your spiritual energy and moral sincerity are however so extraordinary that I'd like to speak of you as a charismatic person. Charisma is a symbolic and moral phenomenon, and its structure is difficult to explain. But charismatic people like you have the extraordinary ability to create and organize something new in life, something that did not exist before. Let me say something about the exceptional qualities which constitute your charisma. You are a philosopher, thinker, psychologist, and someone knowledgeable about the sciences; a person with a brilliant intellect and a warm, open heart as well. I understand your contribution to philosophy as an original and higher form of all contemporary existentialist philosophy, especially in the area of humanist anthropological philosophy. Your new ideas, methods, definitions, scientific terminology and style of thinking and writing are exceptional and it will be hard for us now to find another figure of such importance. You continue the line of Protagoras, Plato, Aristotle, Erasmus and other brilliant thinkers, but in the context of today. You don't repeat the ideas of these people but instead produce a new philosophy that I could characterize as the science of human life: new humanism. Dear Mario, you are not only an abstract philosopher but also a practical one, and a psychologist, too: a psychologist of evolution, of the future, and of the surpassing of human consciousness. The combination of philosophy and psychology creates the possibility of organizing a new practice, a new position; it creates possibilities for living in a new way, in a spiritual, moral, political, family, social, and cultural sense. Thanks to your activity and your energy in the world, there arose the Humanist Movement, which continues to live and grow as an organic social force, while at the same time your ideas expressed in New Humanism become increasingly popular and are appreciated in different countries, for example in my country, Russia. Everyone, all the Russians who had personal contact with you or who knew your works, think and feel in a new way about events and life today. In this context my dear friend, I consider you my master, as a person that I love and whom I'd like to understand deeply, and I want to declare that your influence in my heart and in my head is larger and more organic than all the works of the Marxist theorists that I studied for many years of my life. For me, you are a guide and a source of inspiration, and I feel a profound gratitude for all of this. That is why, my dear friend, it is not very important that we live in different worlds because together we continue our struggles and work in favor of the highest values of humanism. The situation today is difficult, there are many new problems and it is not easy to understand the meaning of these problems and to find the alternatives. For this reason, I am always consulting with you about current issues and in this way I find ideas to respond to these problems. And it is very interesting and fruitful for me to permanently discuss with you the new aspects of life today. Without your teaching, today I would really have no other supports. All your Russian friends send you our greetings. Your image and teaching are for us principal factors of our life. Until we see each other. Ana Luisa Cremaschi, the wife of Mario Luis Rodríguez (SILO). Alexander and Frederick are his sons.